I know this may sound like a homework question, but I assure you it is not. I am seeking for a second opinion about a lecture, usually I would go and ask the lecturer or tutors, but their answers usually leave me with more questions and sadly is a weekend and won't be able to sleep. And this time my Google techniques didn't work. The question is about Double Dipping and it is based on one of my lectures. Which is from some olympic tables and the number of medals is my aggregated attribute. Before going to the Double Dipping problem, we start with the Drill-Down. So the SportDimension was replaced with the SportEventDimension. Because each event can have only 1 of each type of medals, then this would effectively be the Level 0, there is no real aggregation on the NumberOfMedals attribute. In my Level 1, the aggregate function is SUM. In my Level 0, the aggregate function is SUM. (I was told that there MUST always be an aggregate function to be considered a fact attribute, even if there will be no real aggregation). But what if we want to Drill down even further? this time to see who was the athlete to participate in each event. It looks nice... but it is wrong, it was mentioned in my lecture that this is because now we won't be able to answer questions like "how many gold medals did (country) get in 4x100m freestyle relay women". It is also mentioned that this is because the Lvl -1 Fact Table has a different purpose, this time it has to do with athletes and not with sport events. The result of trying to answer the previous question, would be 4 gold medals, because there are 4 participants, each one got their gold medal, but the country only was awarded 1 gold medal because it is only 1 event, and that is Double Dipping, getting more than the real value (as far as I understood). Sample data, the number of gold medals should be 1, but now because of the Athletes dimension and the Double Dipping, we would get 4. To solve this, it was mentioned that we can create a multi-fact star schema. But at the end, it is mentioned that we can avoid the multi-fact and leave the level -1 as it is but mentioning that the AthleteDimension is Determinant. Is there an actual effect just mentioning that the dimension is determinant to eliminate the Double Dipping? My understanding for Determinant is that it is a dimension that MUST be used to give meaning to any query result. I don't quite get it how mentioning it will eliminate the Double Dipping from Level -1 and still being able to drill down from Level 0 successfully. I don't see why you can't have a factless fact table, with the Event, Athlete, and Country as dimensions. You are using the table to record events, rather than measures. I guess that athletes can change countries for different Olympics, so it is a bit tricky to include them in the same hierarchy, though it could be a slowly changing dimension. 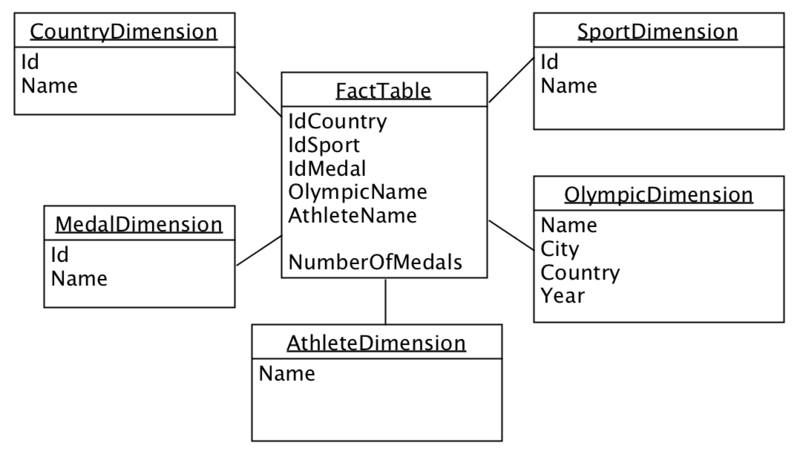 You would use Count(*) as the aggregation, instead of Sum(number_of_medals). Not the answer you're looking for? Browse other questions tagged oracle database-design data-warehouse or ask your own question. In star schemas, what should I do when a dimension has a date attribute? ~2 Billion row fact table in star schema on Oracle. Advisable? how many fact tables do I need given I want to build an OLAP for Quotation Line Item and Purchase Order Line Item report? Time dimension or timestamp in fact table?